Traditionally, young Hutterite girls' hair were braided in the front and back. The Hutterite Style Photo by: Lisa Waldner Traditionally, young Hutterite girls' hair were braided in the front and back. Out to Dry Photo by: Lenita Waldner Families take turns using the communal laundromat. Industrial dryers are available as well, but because nothing can compare to the crisp, fresh scent of air-dried laundry, women prefer to let the sun dry their families' homemade shirts, dresses and blouses. Learning New Skills Photo by: Lisa Hofer Crafts and hobbies are taught to the younger generations at an early age - another means of interaction among community members. The Sewing Room Photo by: Lenita Waldner Since most clothes are homemade, the sewing-room is one of the most important places in our homes. It's a bustling, busy, fun place where sewing lessons are passed down from mother to daughter. How Rugs Start Photo by: Lenita Waldner In order to make rugs, ladies use a wool winding machine to twist multiple varieties of thread onto a spool, as shown. Once the twisted strands are chained, it is crocheted into rugs by hand. Since Hutterites are the ultimate recyclers, other varieties of homemade rugs include fringed jean rugs and weaved fortrell rugs. 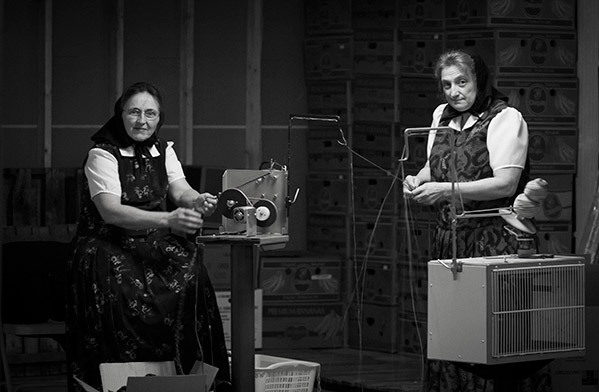 Rugmaking Photo by: Lisa Waldner Ladies crocheting wool rugs is a typical sight on long winter evenings. One rug can take up to a month to complete but is durable and lasts for years. Grandparents Photo by: Kelly Hofer Colony members always support and care for their elderly. They are greatly respected as a rich source of wisdom; stories and experiences are passed from generation to generation through them.